Eurovision World Cup: How it Works! We are quickly approaching one of the world’s most anticipated events, the FIFA world cup where the world’s best Football teams battle it out for the top spot! You may be thinking, ‘this is a Eurovision website, what does football have to do with Eurovision?’ well, you are right, but we are celebrating the FIFA World Cup in the only way we know how – with Eurovision! A total of 32 countries are competing, much like the real World Cup. 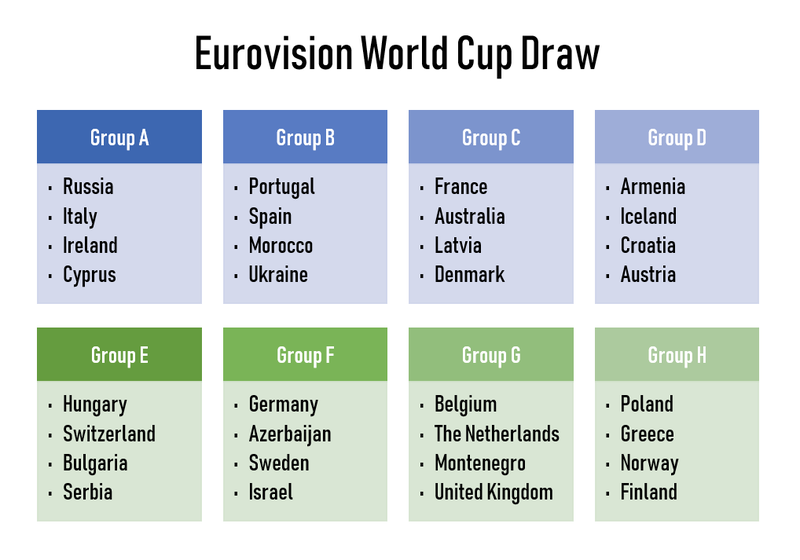 We looked at the World Cup draw, and the nations within that draw who compete (or have competed) at Eurovision are automatically in the competition. This includes Morocco, who have competed at Eurovision just once! For each non-Eurovision country in the official World Cup draw, we have substituted a competing Eurovision nation. As there is a total of 32 countries, unfortunately we couldn’t feature all of the Eurovision nations, but the selection was made in a random fashion. How were the songs selected? Every competing nation is represented by a Eurovision song. For each nation that has won Eurovision, a winning song was chosen as the representative song. If that nation has more than one winning entry, it was at the organiser’s discretion as to which of the winning songs would compete. If the competing nation was yet to win Eurovision, their best placing song was chosen. The schedule of the competition will run completely parallel to the World Cup. The matches are identical to those in the World Cup, with the only difference being that the substituted countries will take the place of the non-Eurovision countries. In the posts for each match, a poll will be used to decide who will be the winner of that match. After the Group stage, the nation with the most wins will be classified as 1, and the nation with the second most wins will be classified as 2. These are the two nations who will continue in the competition. In the case of a tie, a twitter poll will be used. This applies to individual matches, as well as if there is a tie in the Group stage where the two top countries are not clear. Enjoy, and may the best song win!